After arriving home from DMC Florida and turning off the car, the frequency valve 'stuck' in the on position. Diagnosed the problem as my RPM relay sticking (completing the circuit). As this is my second RPM relay problem in the past two years (my other was the car dying out on the highway) I decided to go with the solid state RPM relay offered by Dave (Bitsyncmaster) on DMCTalk.com. 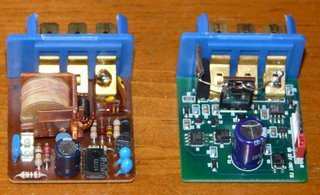 Take a look at this picture comparing the two, and read Ozzies great review on the relay upgrade here.